Unionville Milliken Soccer Club - Striker Papadopoulos signs with TFC Academy! 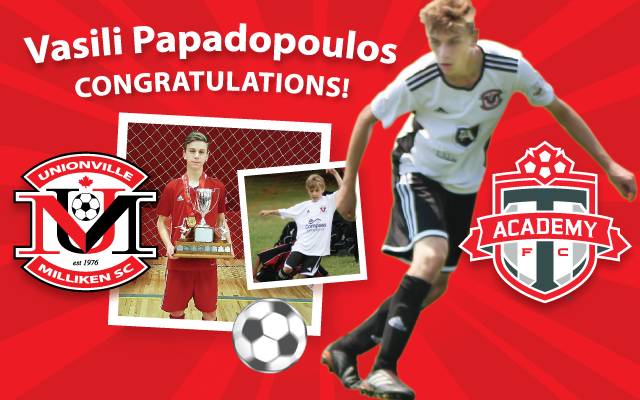 Congratulations to Vasili Papadopoulos, Unionville Milliken Soccer Club Striker signs with TFC Academy! "Unionville Milliken Soccer Club has been my second home for over 10 years; it’s the only soccer home I've known. My coach, Filipe Bento, started teaching me skills and drills from 4 years old. He also has given me a lot of knowledge in soccer and has supported me. Without Unionville Milliken Soccer Club, the staff and Filipe Bento, I would not have been able to achieve this incredible goal. It’s always been my dream to be part of the TFC Academy! Thank you!! We are so proud of Vasili, his growth as an athlete and scholar is nothing short of remarkable. Vasili joined the Unionville Milliken Soccer Club when he was just 4 years old with Coach and Technical Director Filipe Bento. At 7, Vasili joined the competitive program playing a year up with the 2002’s. He then played with the 2003’s OPDL team until 2018. Along the way, the talented Vasili worked very hard to perfect his craft and was selected for the U14 Provincial Team, U15 Provincial Team, OSA Fustal Champions 2 years in a row and most recently his appointment to the Toronto FC Academy. Vasili attends Bill Crothers Secondary School as an elite scholar athlete. Congratulations, Vasili, we are so very #StrikerProud of you!